This enigmatic verse in Sri Aurobindo’s epic Savitri brings out some of the deeper truths of true love, which is not common among human species. How can one be alone in Love? Love means relationship. How can there be loneliness in relationship? To answer this question we have to understand the distinction between what is called as “love” by us and the true love which comes from our divine Self. Human love is a seeking for companionship and for a mutual satisfaction of the emotional thirsts or hunger of each other; it is an attempt to counteract the feeling of loneliness through physical and emotional companionship. For example, when we are physically thirsty and take a sweet drink we are happy and satisfied. When the same thing happens at the emotional level, we call it “Love.” Secondly, human love is a bond of emotional attachment. When the beloved passes away we feel lonely. In the lower forms of human love there is also a sense of possession and a demand for exclusive loyalty. If our beloved loves someone else, we become jealous or unhappy. But the true love or spiritual love is made of qualities which are almost the opposite of human love. When we are not seeking for companionship, free from attachment and feel the joy of loving without wanting to be loved, we are inwardly alone in love among the people we love. Interestingly, two modern spiritual teachers, J. Krishnamurthy and Nisargadatta Maharaj, used the same words, “affectionate detachment” in describing the nature of true love. When our “love” is full of emotional attachment, our mind and heart are tense and crowded with so many thoughts and feelings for the person. When we are free from attachment there is no crowding or hustling of thought and sentiments in the heart which gives a sense or feeling of being inwardly alone. If we have this true love, we can love much more deeply and purely than those who are emotionally attached to the object of love but at the same time inwardly free and alone in Love. The Mother, CWM, Vol. 14, p. 124. 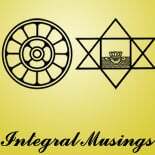 This entry was posted on October 3, 2012 by integralmusings in Harnessing the Human Potential.